This oh-so-thoughtful keepsake doubles as a soft and cuddly blanket. 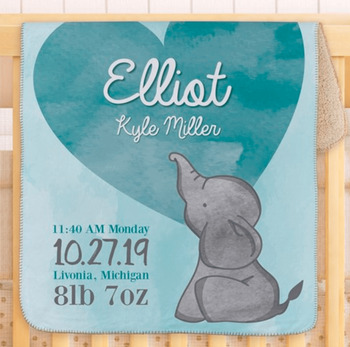 What makes this gift a treasure that will be remembered for many years to come is the detailed personalization that specifies the child's birth information..
* Measures 29" x 39"
You have the option to add gift wrapping. Processing Time Up to 3-4 business days. Does not include shipping time.